Phytophthora blight is caused by the fungal-like oomycete pathogen Phytophthora capsici (Figure 1). 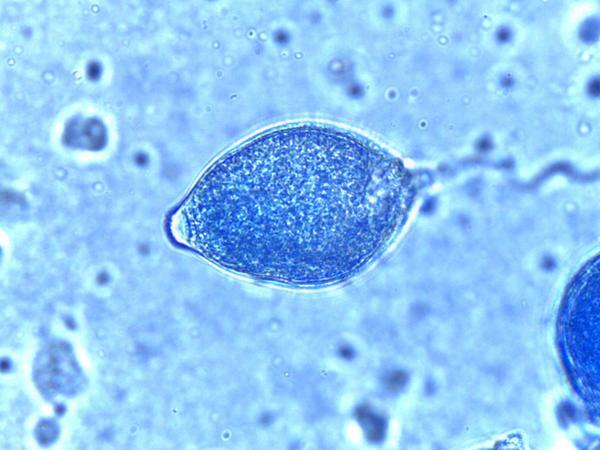 The pathogen may overwinter in the soil when it forms oospores, which are survival structures that can persist for over 10 years. The pathogen can spread rapidly via water and can contaminate irrigation ponds and creeks. Figure 1. P. capsici sporangia as viewed under the microscope. The host range of P. capsici is very broad including bell pepper, hot pepper, eggplant, tomato, snap bean, lima bean, and most cucurbits. The broad host range of P. capsici significantly reduces the efficacy of crop rotation as a control method, however, cereal crops (corn, wheat) are not hosts of P. capsici. P. capsici can produce a wide variety of symptoms depending on the specific plant part involved and the stage of the crop. Since P. capsici is a soilborne pathogen, symptoms usually first develop at the soil line in the roots and crown, however, infection can occur at any plant part where water splashes soil onto the plant. 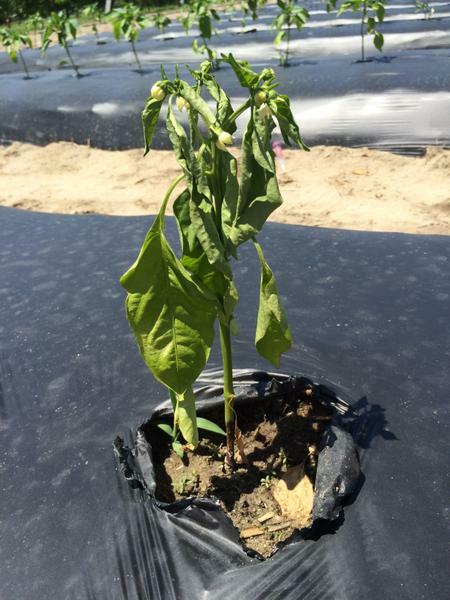 The most common symptoms on peppers are crown rot and fruit rot. Under wet conditions, disease tends to manifest itself as wilting of the plants (Figure 2) followed by plant death. As the disease progresses crown lesions become dark brown and extend upward to girdle the stem causing plant death (Figure 3). Pepper fruits can become infected when rain and overhead irrigation splash infested soil onto emerging fruits. Fruit rot appears as water-soaked areas that eventually become covered with white powdery to cottony mold (Figure 4). Figure 2. Leaves wilting due to P. capsici infection. Water and movement of infested soil via transplants, farm equipment, or tools are the main contributors to pathogen dissemination. Infested irrigation water is a significant source of inoculum and P. capsici zoospores can easily be carried via run-off from rivers, creeks, ditches, streams, and ponds fed by canals. Culls and debris can also become a significant source of inoculum that can infest the soil and surface irrigation water if culls are next to irrigation ponds or creeks. Plant resistant varieties. There are some bell, sweet, and hot peppers with moderate resistance to P. capsici. Plant in field with good drainage and even terrain that will not promote having standing water for prolonged periods of time. Use raised beds and plastic mulch whenever possible. Do not use surface water (ponds, creek) for irrigation since it may be infested. Irrigate moderately from a well via drip, and avoid overhead irrigation especially once fruit is present. Remove diseased fruit or plants away from the field. Do not leave culls in the field or near surface irrigation water sources (ponds, creeks). Harvest fruit as soon as possible from problem fields. Sanitize farm equipment after working on an infested field. Rotate to crops that are not hosts of P. capsici (cereals). Research has demonstrated that soil applications at transplant followed by drip applications when possible offer higher protection against Phytophthora root and crown rot. Sprays ensuring good coverage may be needed to protect fruit in heavily infested sites. Alternate products to avoid generating fungicide-resistant strains. 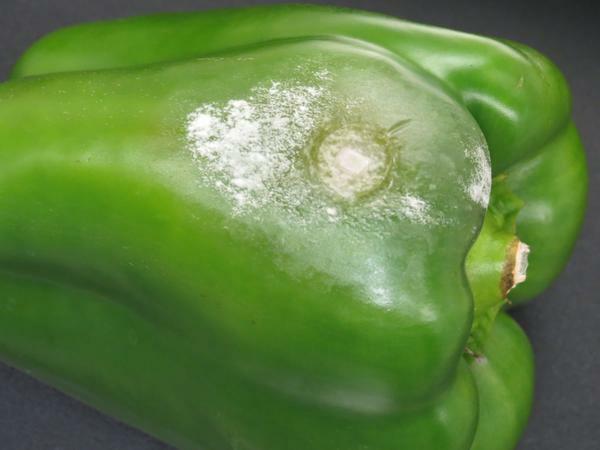 For the latest fungicide recommendations for Phytophthora blight of pepper see the Southeastern US Vegetable Crop Handbook. Fungicide labels are legal documents, always read and follow fungicide labels. The only OMRI labeled active ingredients that have some efficacy against P. capsici are fixed copper formulations. Home gardeners have no chemical control options that are effective and need to rely completely on host resistance and cultural strategies for disease control.